I’m going to let you in on a little secret. Cooking a steak to perfection on the grill really isn’t that hard. I know every steak house and expert griller is denying this vehemently right now, but it’s true. Plain and simple. And I’ll tell you how to do it right every time. Ever since I started dating my boyfriend Sean, he’s been showing and telling me what a great griller he is. We started dating in February, so it wasn’t until the first summer we were dating that he had a chance to prove it to me. He did with so, with flying colors, and taught me the secrets to seasoning and grilling a rib-eye (his steak of choice) or a porterhouse. An excellent grilled rib-eye steak with my go-to salad recipe on the side (see prior blog post) is a match made in heaven for dinner. We have this exact combination almost once a week during the summer, usually on a lazy Sunday evening. Here’s how to make it for yourself. Sprinkle the steak with the paprika, creole seasoning and Worchestershire sauce. Rub gently to get the steak well covered and the flavor into the meat. Spray down grill with olive oil or other non-stick grilling spray once grill is fully heated. Lay steak on grill and cover for four minutes (Sean uses the timer on his iPhone for exact precision). After four minutes, flip the steak and re-cover the grill for another four minutes. If you want to get fancy, lay the steak on the grill for two minutes then rotate 90 degrees for the next two minutes and repeat on the other side – this will give you perfect grill marks like at the steakhouses. After this, remove the steak from the grill and let it rest for 5 – 10 minutes before cutting into it. You now have a perfectly grilled, medium rib eye steak. Guaranteed. Bon appetite! How good does this giant piece of meat look? Pretty damn appetizing to me! Please keep in mind, this is a bone-in rib eye for two people. 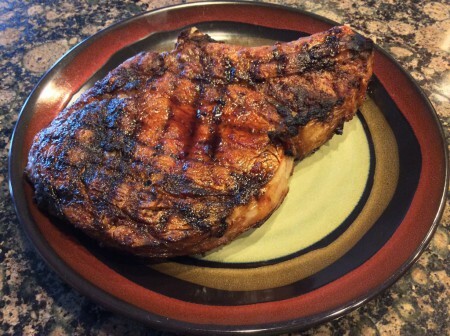 This entry was posted in Entrees, Recipes and tagged Beef, Entrees, Grill, Recipes, Rib Eye, Rib-eye steak, Steak on July 28, 2014 by Paige N..